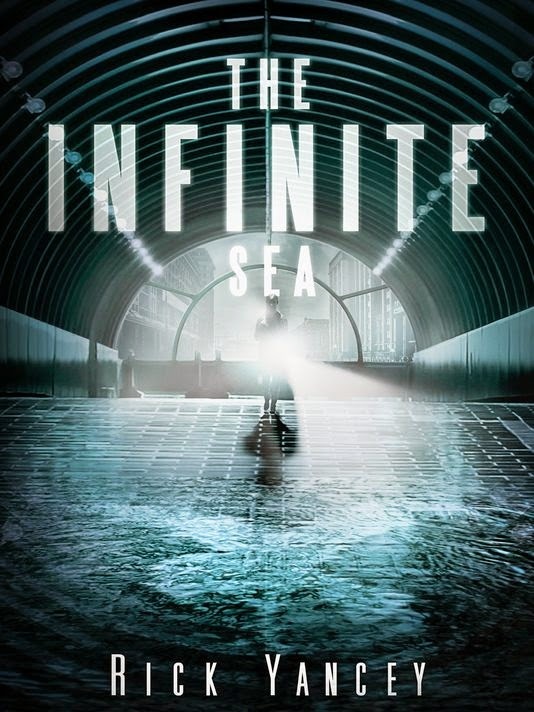 The Infinite Sea is the sequel to The 5th Wave, which I talked about last week here. The 5th Wave was not a book I planned on reading, so naturally I was not prepared for the feelings of shock, angst, and utter panic when I finished it and didn't have The Infinite Sea ready to rock. After much maneuvering and a rather embarrassing day spent at work stalking our shipments every two seconds, I got the book and retreated home to begin, slightly dismayed at the slender package in my hands. It wasn't just a tiny bit thinner. It was like 100+ pages thinner! The Infinite Sea is shorter, it's true, but it contains the characters you love and more stand-out writing. Cassie, Sam, Ben, Ringer, survived the destruction of the previous book's ending and are holed up in an old motel, trying to figure out what to do next. They decide their best chance for survival is to split up and try to find a new place to hide out (yeah, when has that ever worked for anyone ever? ), but the landscape is riddled with enemies looking to hunt them down, and there's no way to tell whose side the strangers are on. What worked shockingly well in The 5th Wave--the shifting narrative--doesn't quite cut it for me in The Infinite Sea. I need you all to understand that I feel like a terrible person for saying this. The writing, on the line level, is excellent. The emotions are vivid and real. The danger and tension are palpable. But there is not as much action as I would have liked, and I don't think that's necessarily the story's fault, but the fault of the structure. To be fair to Yancey, he's got a lot of characters to juggle, one intriguing mystery to uphold (we still don't know what the aliens want with Earth! ), and a lot wild cards in this novel. The characters do whatever the hell they want and don't bend to any prescribed plot, which is awesome, but that does provide some challenges for the telling of the story. Ringer's chapters specifically are very engaging, and I love getting her perspective, but with Ringer's perspective Yancey breaks this unity of time that he brilliantly maintained in the first book, and that disappointed me somewhat. Yeah, yeah, I know I can't have everything. Each part of the novel had its own story arc, but the (only) problem with The Infinite Sea is that all of the parts didn't work together to tell a larger story arc, and I'm afraid that means that this felt like the dreaded second book--a bridge between book one and book three. So I'm left feeling conflicted because this book was well-written and interesting and I love the characters, but it was also jumpy and compressed and did not have as much action. Which, to be fair, might be due to the fact that everyone is still half-dead from surviving the last book. I'm still pre-ordering the third book and I plan on loving it.